Click here for a list of open positions, requirements, etc. Click on the image to download a high-resolution version of the photo. Please login to see contact information for TAEA's leadership. Otherwise, please contact the TAEA Office if you need assistance. What I Love About TAEA: What I love about TAEA is the opportunity to meet and collaborate with so many dedicated, passionate art educators. Each member is advocating and educating others on the importance of art in all Texas educational programs. Rural, urban, suburban - we support one another and are all part of our like-minded and determined TAEA Team. We know art education is essential to human development! What I Love About TAEA: I truly admire the way TAEA has advocated for the visual arts. I love the generosity of our art teachers who give of their time, share their ideas and best practices, and embrace changes in technology so that we may all grow in our artistic pursuits. 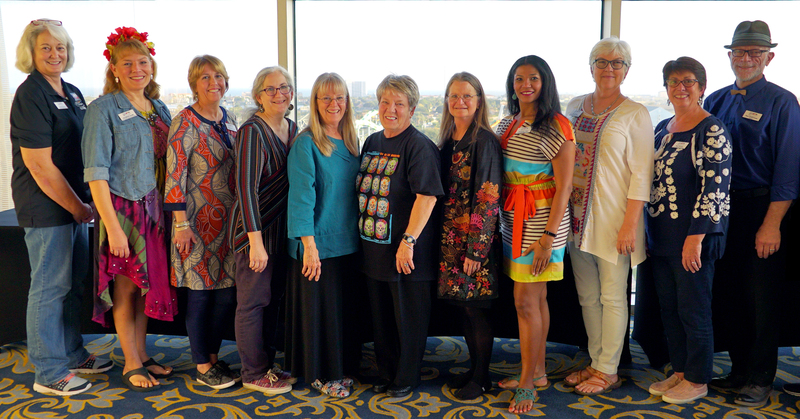 TAEA helps connect art teachers from all areas of Texas and beyond, making us more than just an organization, making us a family. What I Love About TAEA: Fellowship of like minded people is what drew me into TAEA. Everyone is willing to help each other and share their talents, skills, and lessons with all art teachers through Conference, Regional Conferences, and In-Services. You never feel alone because you have your TAEA family to reach out to when you need help. I was helped and now want to give back. I love the excitement that happens when art teachers work together, have fun together, and learn together. We all advocate for our programs and TAEA is here to help all do this. What I Love About TAEA: I love TAEA because the members are positive, creative, and energetic! We are always eager to share new ideas with each other because we want the best for our art students. What I Love About TAEA: Meeting people who share the same passion for Art Education that I do. It is truly amazing how much talent Texas Art Educators have, and I love all of the opportunities we get to collaborate and learn from each other to develop our craft and become the best advocates for our students. What I Love About TAEA: There is so much to love about TAEA! I love all the learning and friendship I've enjoyed through the many years I've been a member. I love the inspiration I gain from being around other like minded people. But most of all I love being part of and giving back to an organization that does so much to enhance the field of art education through leadership, enrichment, advocacy, and fellowship with the most dedicated professionals I've had the privilege to know! TAEA ROCKS!!! What I Love About TAEA: What I love about TAEA is how our members use the power of art to bring people together. In every corner of Texas, our members are promoting art programs in countless ways. In classrooms, museums, community spaces, as well as on-line venues, students and community members bear witness to the transformative efforts of Texas art educators. What I Love About TAEA: I love that at the heart of our mission you find the student. Our advocacy, our pedagogy, our expertise, our passion, our vision, and our beliefs . . . with all of these we encourage, enrich, and educate the young artist. The second thing I love about TAEA is its community of artist-educators. Whether it is colleagues in my home district, friends and TAEA members across the state, or virtual relationships via things like the online book study . . . I connect to a diverse, caring, highly-educated community. Finally, I love the underlying service implied in our membership. I appreciate all that I have gained by my participation in this organization, and I really love that TAEA offers me tangible ways to give back and pay-forward. What I Love About TAEA: TAEA feels like "home" where professional art educators gather to exchange ideas, dialogue, and solve the issues of the world. It creates a safety net to hold members close to mentor, grow, and provide resources when needed. It offers nourishment for those that are hungry for professional development or networking. It holds out helping hands for new comers who want and need guidance. TAEA is a place to have fun, to grow professionally, to make new art friends and find the newest art materials and equipment on the market. TAEA helps makes its members great educators. Don't you want to join our art education home? What I Love About TAEA: I have always taught in schools where I have been the sole art teacher, so TAEA is my connection to other teachers. TAEA is the place in which I collaborated for new ideas and techniques for my classroom. What I Love About TAEA: TAEA has become a very important part of my life as an art educator. It has helped me grow as an elementary art teacher and as a leader in the art community. It has helped me become more confident amongst my peers. I love the support that I feel when I talk to other members. What I Love About TAEA: I love being part of an organization designed to nurture teaching skills and creative as well as intellectual growth. We have the unique opportunity to work alongside art educators who hold a variety of strong artistic and leadership qualities and ability to create a lasting love of art for our students. TAEA will take you on a journey of lifelong learning. 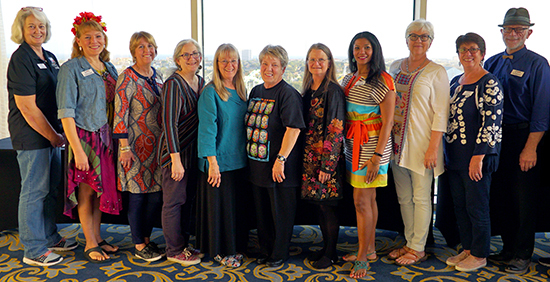 What I Love About TAEA: Being a member of TAEA since my 4th or 5th year of teaching, I have collected invaluable advice, knowledge, motivation, and friendships. I simply cannot imagine my teaching career without it. Yes, I have local friendships with local art teachers in my community and district; however, the personal and professional connections I have garnered through TAEA have allowed me to reach a level of art education competence that is immeasurable without the collaboration and teaching of this organization. Above all, TAEA has helped me always remember why we are here! Thank you TAEA!! What I Love About TAEA: Being connected to a community of fellow Art Educators. This is not an organization that is on paper. It is active, creative, and very present. I am amazed at the constant motivation and innovation of all members and am excited to be a part of this association. What I Love About TAEA: It is rewarding to be a part of the excitement that fills the space when two or more of us gather. I love the fact that we share a common passion for art and go to exceptional lengths to serve, and teach art, as an entity that enriches lives. From sharing all that TAEA, has to offer, we grow together personally and professionally, as a community, in preparing artists, teachers and leaders that will serve future generations. What I Love About TAEA: TAEA is a group that not only promotes art education, but leadership as well. I always felt like I could do more, and TAEA has given me the opportunity to serve students like myself and to become the leader I want to be. What I Love About TAEA: TAEA connects art educators from across the state in the continual improvement of our discipline for excellence in learning — no matter if your audience is public school students, museum visitor, or pre-service teacher. I love that we collaborate, advocate, learn, demonstrate, make art, and in the process enjoy and appreciate the experience and our colleagues. Each member is engaged in our focus to advocate, grow, lead, and serve to leave art education better than we found it. TAEA is a vibrant and amazing community! What I Love About TAEA: I love that TAEA is an organization that gives HUGE returns on my personal investments. Since joining, it has been made abundantly clear that the organization is willing to give back what I put in, and then some! It definitely embodies the expression, "you get out what you put in." I actively searched for mentors, and was met with open arms and wonderful support! I made myself available for networking opportunities, and now I feel as though I am connected with colleagues all over this great state! When I needed opportunities to grow my leadership potential, the organization made this possible. Having joined while doing my undergrad, TAEA has literally been a part of my entire art education career, and I feel as though I am truly making a difference in my classroom as well as the art education theatre in Texas as a whole! What I Love About TAEA: I love TAEA because it facilitates art educators' connections to other art educators and to community arts partners, which serves to increase our visibility and strengthen our voice for advocacy. What I Love About TAEA: Art, energy, enthusiasm, unlimited opportunity for learning, laughter, friends, shared stories, shared history, accept-me-as-I-am art family . . . TAEA - MY TRIBE. What I Love About TAEA: TAEA gives me the opportunity to share successes, passions, methods and fellowship with my colleagues. Being around other gifted educators that "live to create" always recharges my batteries and keeps me focused on my goal of inspiring my love of the arts in my students. What I Love About TAEA: I love being able to be around like minded people and people who share the same passion about art education as I do. The members of TAEA are so passionate about what they do and the students they do it for. I am proud to have made many lasting friendships throughout the years I've been involved in TAEA. I look forward to the times we share and I always come away feeling like I've grown as a teacher, artist, and professional. What I Love About TAEA: Friendship, Motivation, and a Structure for Success and Excellence — When I started TAEA I was blown away by the phenomenal state conference with professional development that actually pertained to my teaching. Over the years I've found an extensive support group of fellow art teachers and mentors who support my dreams and offer motivation when needed. Age, gender, race, and faith differences are set aside in TAEA. No matter who you are, you are appreciated. After all these years of getting, it's my turn to start giving back to this incredibly influential organization that has played such a strong role in who I am today and the success of my students. What I Love About TAEA: For me, TAEA is about opportunities: to grow, learn, connect, and collaborate with my colleagues. TAEA is such a rich community of individuals, all so willing to take another member by the hand and share. I am passionate about TAEA and so excited to be a part of this vibrant collection of educators. What I Love About TAEA: Membership in TAEA has helped me form lifelong relationships with a network of people who have been, and are, willing to help me grow personally and professionally. Our organization listens to our members and is always willing to go above and beyond to help all involved in art education. Our organization is on the forefront of change as the demands of our profession grow and change. The continued support of our leadership has helped me find, keep, and grow in my passion for quality art education. What I Love About TAEA: I love the creativity of TAEA and the friendships I have gained over the years of serving with TAEA members. I work in the IT world of K-12 education. Serving in TAEA always me to dabble and grow creatively when I feel boxed in with the wires and cables. What I Love About TAEA: What I love about TAEA is the opportunity to connect with art educators from across the state of Texas. The support, inspiration, and friendships from fellow members inspires me throughout the school year. What I Love About TAEA: What I love about TAEA is the sense of camaraderie it instills into each of its members by celebrating differences and connecting through the arts. Teachers come together to support, guide and inspire one another creating a system of professional art lovers. TAEA also gives plenty of opportunities for students to become more involved in the arts in the form of exhibitions and galleries. It looks to promote a sense of pride and respect for what is sometimes seen as unnecessary in education and switch mentalities in order to give us the future artists of the world. What I Love About TAEA: To me TAEA is an art family. We help each other succeed inside the classroom, and have opportunities to achieve success as educators outside the classroom. I have grown so much as a professional and an artist because of the dedication TAEA's members have to new members. Networking, collaboration, and celebration of the arts is what TAEA does best! What I Love About TAEA: As a new transplant to Texas, I love the warm welcome I've received from artists and art educators. The statewide community is powerfully in tune with each other, supportive, and deeply committed to art and innovation. I'm excited to join this rich and varied conversation, and thrilled to be in Texas! What I Love About TAEA: I love how TAEA brings people together no matter age or location! I have so many surrogate family members through TAEA, members that live nowhere near me, but when we meet up, it's as if no time has passed. TAEA is an organization where your voice is heard and where you are supported; and in return, you are able to support and mentor new members. I love my TAEA family!